The New York University Tisch School of the Arts (commonly referred to as Tisch) is the performing, cinematic and media arts school of New York University. 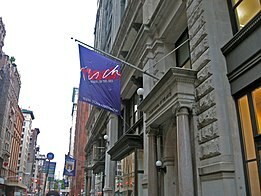 Founded on August 17, 1965, Tisch is a training ground for artists, scholars of the arts, and filmmakers; the school merges the technical training of a professional school with the academic resources of a major research university to immerse students in their intended artistic disciplines. The school is divided into three Institutes: Performing Arts, Emerging Media, and the Kanbar Institute of Film & Television. Many undergraduate and graduate disciplines are available for students, including: acting, dance, drama, performance studies, design for stage and film, musical theatre writing, photography, game design and development, and film and television studies. The school also offers an inter-disciplinary "collaborative arts" program, high school programs, continuing education in the arts for the general public, as well as the Clive Davis School Institute of Recorded Music, which teaches entrepreneurial strategies in the music recording industry. A dual MFA/MBA graduate program is also offered, allowing students to take coursework at both Tisch and NYU's Stern School of Business. It is located at 721 Broadway (the intersection of Broadway St. and Waverly Place), adjacent to the University's Department of Philosophy building and the Gallatin School of Individualized Study, in the Greenwich Village neighborhood of Lower Manhattan, New York City. As of 2017[update], the school had more than 25,000 alumni working in the arts and related professions, and has more alumni in Broadway theatre than any other school for theater in the United States. Also in 2017 alone, six members of the Tisch alumni community were nominated for an Oscar. Over the past 10 Student Academy Award ceremonies, it is one of only two US schools to have double-digit wins. The school is among the most competitive American film schools to enroll in; with many famous alumni having gone to work in the American film industry, Broadway theatre, and in entertainment industries around the world, Tisch is typically ranked among the top American film schools, as such with yearly consistency in notable industry publications such as THR and Variety, and is often considered as one of the top film and theater schools in the United States and the world. The Tisch School of the Arts was founded in order to provide conservatory training in theater and film in the context of a research university. The school created additional departments such as dance, theatre design, and cinema studies within a few years. Following the creation of the undergraduate Department of Drama in 1974, the school expanded into other artistic forms, including the Interactive Telecommunications Program, Department of Dramatic Writing, Department of Performance Studies, Graduate Musical Theatre Writing Program, Department of Photography and Imaging, and The Department of Art and Public Policy. In 1985, the school's first dean, David Oppenheim, solicited a donation from Laurence A. and Preston Robert Tisch that made possible the acquisition and renovation of the location at 721 Broadway where most of the school’s programs are housed. In recognition of the generosity of the Tisch family, the school was renamed Tisch School of the Arts. Tisch School of the Arts has three institutes and 16 programs and offers the Bachelor of Fine Arts (BFA), Bachelor of Arts (BA), Master of Fine Arts (MFA), Master of Arts (MA), Master of Professional Studies (MPS), and Doctor of Philosophy (PhD) degrees. Tisch also offers a selection of classes to NYU students not enrolled in any of its programs through the Open Arts curriculum. The school also offers an inter-disciplinary "collaborative arts" program, as well as the Clive Davis School Institute of Recorded Music (founded by Sony Music CEO Clive Davis), one of the few programs in the US to combine musical arts and business strategies in the recording industry. A dual MFA/MBA graduate program is also offered, allowing students to take coursework at both Tisch and NYU's Stern School of Business. It also offers high school programs (the "Tisch Summer High School Program" and "Spring Future Artists Programs") as an outgrowth of the undergraduate classes, and professional courses for the general public as part of a commitment to continuing education in the arts. NYU's first branch campus abroad was the result of a partnership with Singapore Government agencies under Singapore's Global Schoolhouse program. Tisch Asia was also Singapore’s first graduate arts school and offered Master of Fine Arts degrees in animation and digital arts, dramatic writing, film and international media producing. Summer programs included professional workshops and non-credit certificate courses. The campus opened in fall 2007 on the former Ministry of Education & Republic Polytechnic grounds at 3 Kay Siang Road, Singapore, with the intention to enroll approximately 250 students. The anticipated enrollment figures were not achieved, financial irregularities were alleged and Tisch Asia President Pari Sara Shirazi was dismissed from her post by NYU in November 2011. In a letter to the Tisch Asia community dated 8 November 2012, Dean Mary Schmidt Campbell announced that the campus would close after 2014 with recruitment and admission of new students suspended with immediate effect. While celebrating the creative and academic achievements at the Singapore campus, she cited financial challenges as the reason for the closure decision. Schmidt-Campbell pledged that NYU would honour commitments to existing students and staff. The letter quoted support from Singapore's Economic Development Board stating that it remained open to future collaboration with NYU. Subsequent reporting has begun to reveal details of the complex negotiations around the closure. ^ a b c d "About Tisch". tisch.nyu.edu. Retrieved 2018-12-29. ^ a b "Collaborative Arts". tisch.nyu.edu. Retrieved 2018-12-29. ^ a b "Clive Davis Institute of Recorded Music - NYU". tisch.nyu.edu. Retrieved 2018-12-29. ^ a b "What an MFA Degree Is and What You Need to Know". WTOP. 2018-12-12. Retrieved 2018-12-29. ^ a b "15 Best Film Schools In The U.S. To Become An Award-Winning Short Filmmaker". blog.miniflix.tv. Retrieved 2018-12-29. ^ a b "3. American Film Institute - The Top 25 American Film Schools". The Hollywood Reporter. Retrieved 2018-12-29. ^ "Top Film Schools Around the World". Top Universities. 2018-02-06. Retrieved 2018-12-29. ^ "Dean's Message: Tisch School of the Arts". Tisch School of the Arts. Retrieved 1 Feb 2014. ^ "History: Tisch School of the Arts". Tisch School of the Arts. Retrieved 23 June 2012. ^ "History: Tisch School of the Arts". Tisch School of the Arts. Retrieved 1 Feb 2014. ^ HEVESI, DENNIS. "Davis Oppenheim, 85, Dean of N.Y.U. Arts, Is Dead". The New York Times. The New York Times. Retrieved 29 August 2015. ^ MITGANG, HERBERT. "7.5 MILLION TISCH GIFT TO N.Y.U". The New York Times. New York Times. Retrieved 29 August 2015. ^ "Departments: Tisch School of the Arts". Tisch School of the Arts. Archived from the original on 23 February 2014. Retrieved 1 Feb 2014. ^ "High School Programs". tisch.nyu.edu. Retrieved 2018-12-29. ^ "Professional Courses". tisch.nyu.edu. Retrieved 2018-12-29. ^ "NYU's Tisch School Of The Arts opens its first campus in Singapore". Singapore Economic Development Board. 2009-05-28 [1st pub. 2007-10-08]. Archived from the original on 2012-02-23. ^ "Anatomy Of A Failed Campus: What Happened At Tisch Asia". Retrieved 2013-07-14. Wikimedia Commons has media related to Tisch School of the Arts.